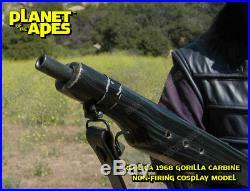 As part of our on-going APE-RIL 50th Anniversary celebration, we are offering up this oober-extremely detailed NON-FIRING 1:1 scale REPLICA of an original screen-used 1968 Planet of the Apes GORILLA CARBINE complete with: screen-accurate details, swiveling leather sling strap, and spring-loaded trigger mechanism. 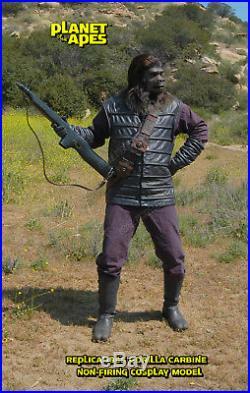 This amazing replica was painstakingly patterned and detailed by master Hollywood modelers to match the original "HERO" movie prop rifles used in the classic original 1968 Planet of the Apes movie. The original screen-used movie prop stocks were nothing more than pine wood. 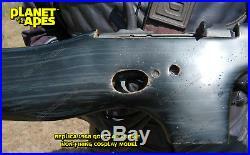 Our replica stock here is reinforced fiberglass construction painted to look like wood, with added "relic" details. There is no wood visible anywhere on this prop. The expert painters are fooling your eyes! The stock has been sealed with hi-gloss automotive clear-coat to protect the expert faux wood detailing and give it that cool showroom shine (when polished) that every gorilla always wanted. This replica movie prop rifle meets ATF requirements for "non-gun" status. It's a cosplay/display prop, folks! (check the video link for more details). Customers from outside the USA, review your local replica model firearms laws and importing statutes before ordering. 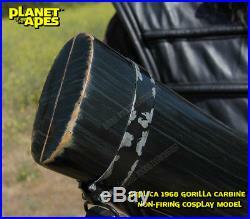 Truly a centerpiece for any Planet of the Apes fan's collection, man-cave, or cosplay adventurer! As part of our GO APE! 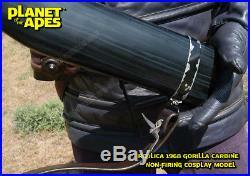 APE-RIL 50th Anniversary Sale, we have discounted the price for this particular replica. Add one of our enviable out-of-this-world embroidered soft cases to travel to ComicCon in true simian style! If you want to display it with primate pride, ask us about our faux sandstone wall display plaques. This is considered our non-firing "economy" cosplay model. 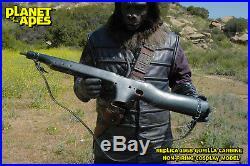 We also have DELUXE airsoft models of the 1968 and 1970 ape carbines, for those Gorillas set to conquer the Forbidden Zone! Simians of higher intelligence will ask about our factory-second economy models! And for those live-fire hobbiest/fans, check out our replica'68 POTA and'70 BENEATH the POTA rifle stocks that have been designed to specifically house real US M1 Carbines or RUGER 10/22s! They are a blast on the target range! 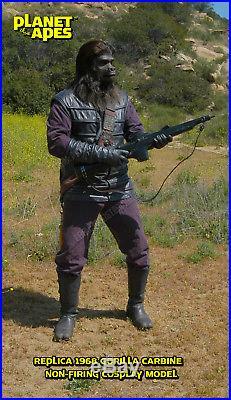 MKUP (6587) Check out our other REPLICA Planet of the Apes cosplay costume and prop items currently available (and completed listings/auctions) to see what other cool stuff you can get to help build your simian army! 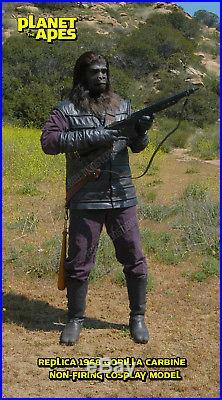 The item "1968 Planet of the Apes REPLICA Gorilla Carbine cosplay prop" is in sale since Monday, May 07, 2018. This item is in the category "Entertainment Memorabilia\Movie Memorabilia\Props\Reproductions". The seller is "monstermaker" and is located in Chatsworth, California. This item can be shipped worldwide.